Eating breakfast before a workout can help you burn more carbohydrates during your workout and help you digest food after your workout more quickly - according to a new study. As a dedicated runner it has always played on my mind whether I should eat breakfast before my morning runs or simply do it on an empty stomach. In the past I would go out on an empty stomach but more recently I have changed to eating something before heading out the door. According to new research, it would appear I made the right choice in doing so. 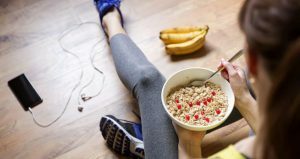 A new study done by the Researchers and the University of Bath, UK, revealed that eating a nutritious breakfast before your workout increases the rate your body digests and metabolizes carbohydrates both during and after exercise. 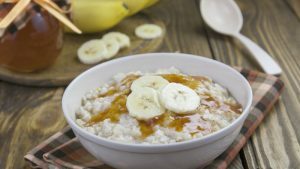 The Researchers looked at a group of 12 healthy men who were all told to eat a breakfast of porridge and milk two hours before they worked out. Blood samples were taken to see how each individual was utilizing the food they had eaten during and after the workout. The workout was an hour of cycling. The study found that eating breakfast increased the rate in which the body burned carbs during exercise. It also showed that these effects continued after the exercise when the men consumed their post workout meal. They also found that the carbs that were burned during exercise were not only from the breakfast eaten. They found carbs stored in the muscles as glycogen were also being used. This suggests that consuming a breakfast before a workout of an hour long, can help get your body ready to absorb nutrients afterwards to replenish the body and aid in recovery. Eating something before your workout not only helps you have the energy to complete the workout but it also helps the body rapidly absorb nutrients afterwards too in your post workout meal. This study was published in the American Journal of Physiology, Endocrinilogy and Metabolism and can be found here. Although this study was tightly controlled, it only involved 12 men so is a very small sample. It does appear to be quite interesting and would benefit from further research with more participants. Skipping breakfast can, however, have a positive effect, with some suggesting you can speed up weight loss. One study found that participants who exercised while fasted burned nearly 20% more fat than those who had a meal beforehand (1). Another study also found similar results when it came to aerobic training (​2). This is a case of the body switching fuel sources from glycogen/carbs (which have been depleted) to fat. Which is ultimately great if your goal is fat loss but everyone has different goals and for many exercise performance is more important than fat loss. The other problem with this way of exercising is that your body will compensate for the fat loss by burning less calories as it adapts to the fact you are burning so much fat. It goes into survival mode. It could also potentially leave you with less muscle. In reality if you want to eat breakfast or feel you need it before a workout then this new study should give you the confidence to continue to do so. You need to also prioritise your goals. Different workouts have different goals. Some of my runs are very easy recovery runs, where I really don't need to worry so much when it comes to fuelling. While others will be tough interval or tempo sessions that will require a level of fuelling to help me push and be at my best. If you're hitting the gym to lift weights, eating breakfast beforehand will probably help you push much harder than if you feel like you have no energy because you haven't eaten. I have been on plenty of long runs where I have bonked because I didn't eat breakfast and my nutrition was a bit off the day before. So with anything, you do need to factor in your own individual circumstances when fuelling your body for a workout. If you have to get up very early for a workout then you may find eating breakfast quite difficult. Some people are just not ready to eat early in the morning. You could opt for something small like a banana or some toast. You could even opt for a smaller amount of cereal or porridge. This may be much more beneifcial if you don't have a lot of time between getting up early and fitting your workout in. Something small may be just enough to get you through. if you can handle more than opt for a proper bowl of porridge or smoothie instead. You could also try a pre workout shake to see if this is an easier option for you. The key is to working out what your body can handle before a run. If I am up really early, I like to opt for a protein bar that gives me the right amount of protein and carbohydrates. This usually is enough to get me through the workout. If I have longer for it to digest then I opt for a spelt pancake. Experiment with your choices to see what your body can handle beforehand.